Beocenter 2500 Cassette Deck. A set of 3 X Drive Belts for Bang & Olufsen. Supplied complete with 3 x Alcohol Swabs to clean the belt path of old residue. 1 x Flat cross-section Belt. Ideal for refurbishing and repair. Compatible Product Line: Cassette Deck. Content: 2 Square Belts 3 Flat Belts. Compatible Model: HCD-DR6. New Idler Reel Table Tire / Tyre for Cassette. 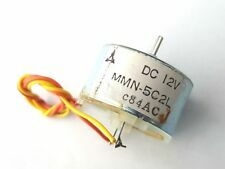 Size: 18.40 / 11.50 / 2.50mm. An Idler Tires /Tyre for use with ma ny popular Cassette Decks. Ideal for the refurbishing and repair of Cassette Decks. Thickness: 2.50 mm. 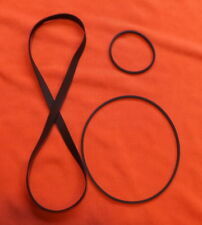 A selection of Ten Longer Drive Belts for use on most popular VCRs. If you require Flat Section belts Link Disabled:?. fsoo=1&fsop=1&query=cassette belt&saprchi=&saprclo=&sid=47199399&sofp=0&srchdesc=y">Specific Size Flat Belts. 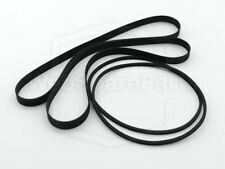 A Main Drive Belt for the following Aiwa Cassette Decks Note: picture shown is not of actual belt - it is a representation only. In: = Closed antenna length. Out: = Length of antenna open. - 6 Weeks to Asia. - 3 Weeks to the Canada, USA, Australia. Ideal for the refurbishing and repair of Cassette Players and Walkmans. / Flat belts and for a Cassette Deck Belt Kit Link Disabled Belts. 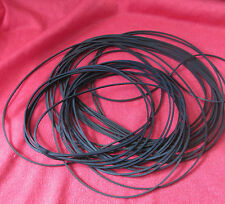 A set of 28 Drive Belts for use on most popular Cassette Decks & Other Audio Devices. Note: There may be duplicate sizes in the selection. A set of 28 belts. Compatible Product Line: CD Player. Content: 1 Flat Belt. - 3 Weeks to the Canada, USA, Australia. - 1 Week to UK. If you do not receive your item after. Content: 4 Square Belts. - 1 Week to UK. If you do not receive your item after. Pair of flat belts for Aiwa AD-WX616 deck. New belts. WE ONLY USE TOP QUALITY JAPANESE. This belt kit has 2 rubber belts ie every rubber belt inside the Beocord this kit will fit the following Beocords. Beocord 6000 (1981-1982). Beocord 6002 (1983-1984). Beocord 8000 (1981). Beocord 8002 (1982). Product Line: Cassette Deck. Content: 2 Square Belts 1 Flat Belt. If you do not receive your item after. A selection of 32 Drive Belts for use on most popular Cassette Decks & Other Audio Devices. A set of 32 belts. Compatible Product Line: Cassette Deck. Content: 2 Square Belts 3 Flat Belts. Compatible Model: DHC-MDX10. Compatible Product Line: Cassette Deck. Content: 3 Square Belts 2 Flat Belts. Compatible Model: MHC-BX7. 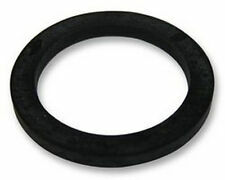 Brand New Set of 16 Square Section Rubber Belts Cassette/Audio. 24-70mm. Diam. Fsoo=1&fsop=1&query=cassette belt&saprchi=&saprclo=&sid=47199399&sofp=0&srchdesc=y">Specific Size Belts for Cassette Decks. A set of 15 Drive Belts for use on most popular Cassette Decks & Other Audio Devices. Aiwa AD-WX 929 Cassette Deck. 2 x Square cross-section Belt. A set of 4 X Drive Belts for. Ideal for refurbishing and repair. Note - picture shown may not be of actual belts - it is for indication only. Compatible Product Line: Cassette Deck. Content: 1 Square Belt 1 Flat Belt ! If you do not receive your item after. Two Main Belts for the Aiwa AD-F850 Cassette Deck. Cross Section - 1.00 mm. A 54.00 mm. / Flat belts and for a cassette deck belt kit Link Disabled ?. fsoo=1&fsop=1&query=cassette belt&saprchi=&saprclo=&sid=47199399&sofp=0&srchdesc=y">Belts. Compatible Product Line: Cassette Deck. Content: 3 Square Belts 2 Flat Belts. Compatible Model: LBT-LX6. One Belt for the Sony Walkman. Kit of 3 belts for this Hitachi boombox top quality Japanese belts are used. 12/2018.One of our first kits. over nearly 3 years now a complaint! trying to find out why?. Have checked & rechecked. A selection of 40 Drive Belts for use on most popular Cassette Decks & Other Audio Devices. A Main Belt for the Aiwa AD-F850 Cassette Deck. Note: picture shown is not of actual belt - it is a representation only. Our range of Walkman belts are well tested and produce. Our belts are produced with high precision providing high quality output whilst reducing artifacts, wow and flutter. .if you buy & its not correct we will correct. Compatible Product Line: Cassette Deck. Content: 3 Square Belts 1 Flat Belt. If you do not receive your item after. / Flat belts and for a cassette deck belt kit Link Disabled ?. fsoo=1&fsop=1&query=cassette belt&saprchi=&saprclo=&sid=47199399&sofp=0&srchdesc=y">Belts. A 18.00 mm. Ideal for the refurbishing and repair of cassette decks and any other device that uses rubber drive belts such as DVD players, CD players etc.